Graphic 45 Time to Flourish 12 and 13 April…. 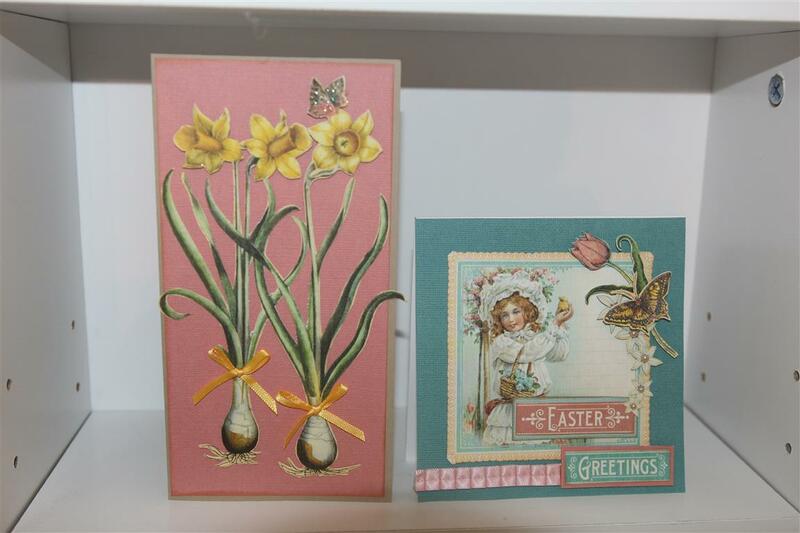 two quick cards today made with graphic 45 Time to flourish april sheets. On the left, a lot of fussy cutting ( this is more than likely going to be Mums Mothers day card as she loves daffodils) and on the right a very quick and easy easter card., with a little nit of fussy cutting stuck around the image for a bit of interest!we are having power cuts on and off today, luckily we have been warned, but every time the power comes back on there is a mad rush to the computer! it’s amazing how reliant we have become on technology! Til tomorrow…. Graphic 45 Time to Flourish ..April papers..
A very quick Easter card today, using Graphic 45 Time to Flourish April papers.This card didn’t need much extra at all – just a seam binding bow with a tiny flower, and the background layer punched with my Martha stewart Doily punch.A day of doctors today, Joe has his check up with the specialist after his knee operations, and then dad of to the local hospital for a cardiologist appt. Hopefully both get a clean bill of health. Til tomorow…. Graphic 45 Sweet sentiments number 7.. Easter.. 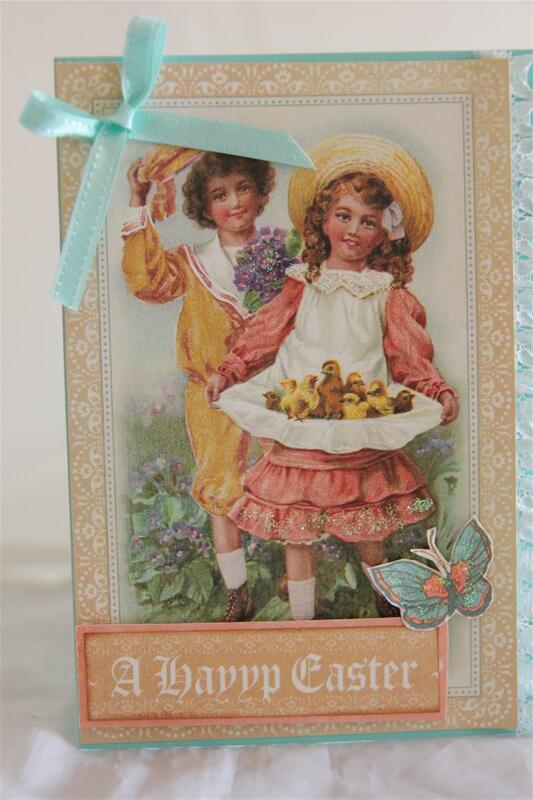 This is the final Graphic 45 Sweet sentiments for now,an easter card with a fair ammount of fussy cutting. I mounted the main image on a spellbinders 5x 7 enchanted labels 28, and added a stampin up ruffled ribbon.Tomorrow we start on my graphic 45 Botanical tea series – there are quite a few so we may take a break in between these ones! til tomorrow…. 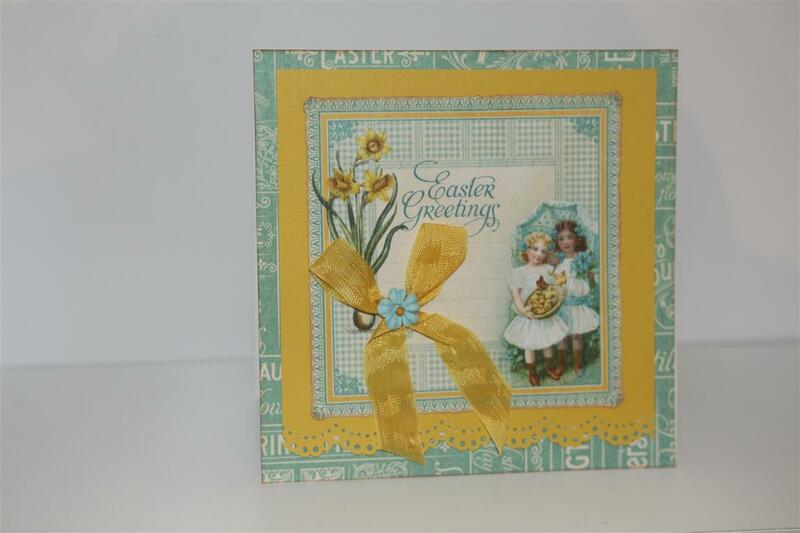 Graphic 45 Sweet Sentiments 6 … easter..
Today and tomorrow a couple of Easter cards made with Graphic 45 Sweet Sentiments patterned paper. This one has a bit of layering, and I used Stampin Up Wisteria Wonder and Baja Breeze cardstock, and a great piece of lace for a bit of texture.I have spent much of today looking for a particular range of paper in my craft room with no luck and I have my heart set on finding it because it’s time to make some mens cards, and it will be perfect. Once I find it. So for now it’s back to the room to continue looking! Til tomorrow…. 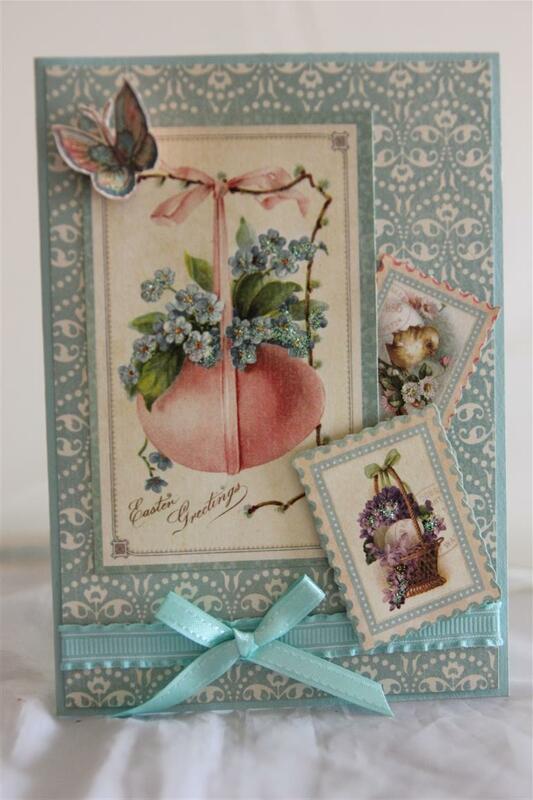 The last one in this series for now, graphic 45 sweet sentiments, an easter card. a bit of fussy cutting, and stampin up cardstock and ribbon – Pool party. Something new tomorrow. It was back to work for me today, and very busy it was too, so just a relaxing night in front of the tv for me tonight! til tomorrow…. 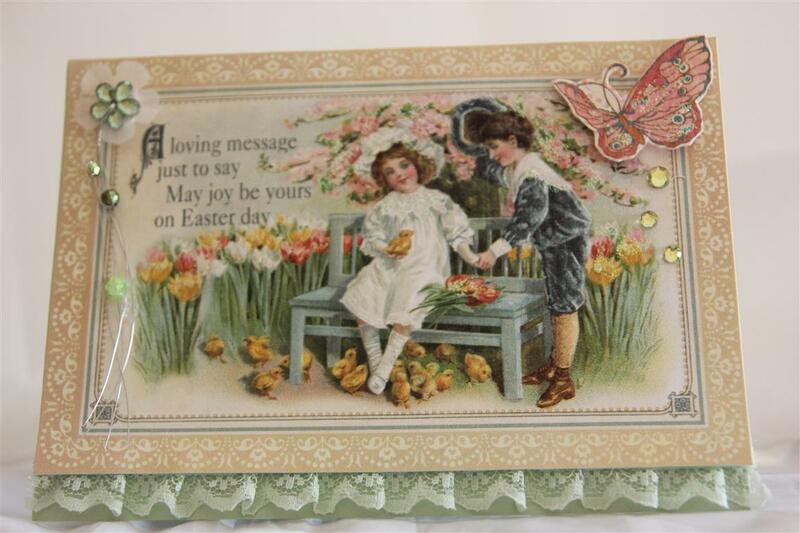 Graphic 45 sweet sentiments 4, Easter card. Another simple card for eater using graphic 45 Sweet sentiments collection. The cardstock and ribbon is Stampin Up pool Party, and I did some highlighting with some kindyglitz. 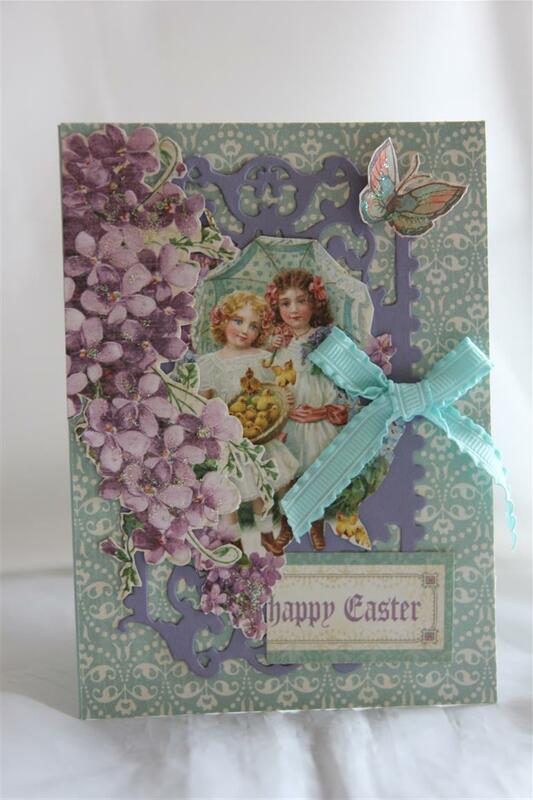 today i have been busy making a few more Easter cards with this collection,and trying out a few new dies, back to work tomorrow… til tomorrow…. 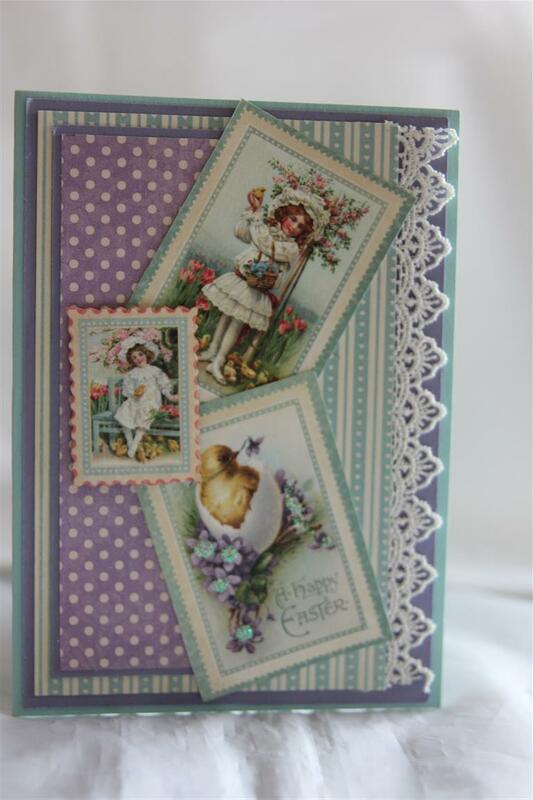 As the Easter eggs find their way to our shop shelves, it is time to post a few easter cards i ahve made with graphic 45 Sweet sentiments paper collection. An easy one this one – the image is all one piece from a piece of the 12 x 12 paper, and I just added lace and rhinestones. The butterfly was fussy cut from another piece of the paper collection. off out tonight to investigate the adelaide fringe festival, so til tomorrow…..